“Uh oh” is not what you want to hear, ever, but this phrase is especially nerve-wracking when you’re conducting fieldwork on the impacts of gold mining in the Amazon using expensive equipment and sensitive mercury collectors amongst a crowd (miners) that does not want the authorities in their business. This particular “uh oh” came from the least likely person – our boat guide Ramiro, who is incredibly nonchalant, always telling us not to worry and that bullet ants only hurt un poco. So, as we sat in the boat and saw Ramiro’s reaction as he walked up the riverbank and into one of our sites, we knew something crazy must have occurred, but we couldn’t even begin to imagine what we saw next. An area once so dense it required a machete to enter, now was flattened; there were no trees, bushes, or even small plants – just heaping piles of branches that had been stacked while the surrounding forest was burned. 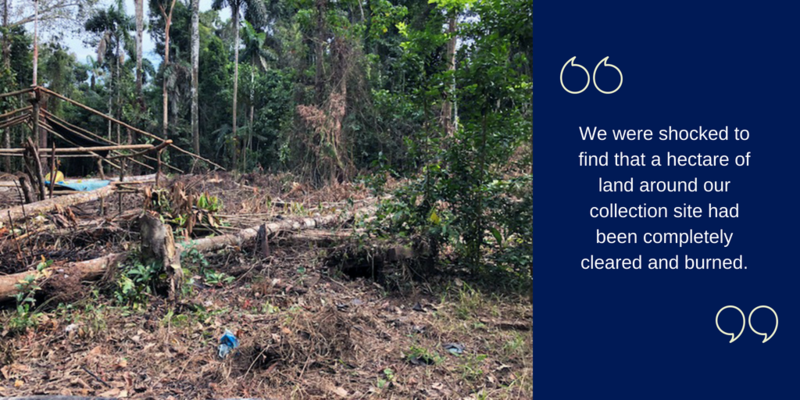 As we entered one of our sites – which was once a pristine, seemingly untouched area of the rainforest near the Chilive River – we were shocked to find that about a hectare of land around our collection site had been completely cleared and burned. An area once so dense it required a machete to enter, now was flattened; there were no trees, bushes, or even small plants – just heaping piles of branches that had been stacked while the surrounding forest was burned. On top of the lack of forest, there was now a house being built about twenty feet from our collection site, complete with a firepit and clothes drying on a line – likely the new home of a logger wanting to live closer to the forest he cuts down. Upon seeing the destruction, we ran to our open precipitation collection site (a group of five, meter-tall PVC tubes containing funnels and bottles to collect rainwater). We wanted to see if anything had been tampered with and expected our collection setups to be damaged, along with the rest of the forest. Amazingly, it seemed our “DO NOT TOUCH/ NO TOCAR” sign had deterred the people from touching our sensitive tubes or burning within a small radius around them. They had also left untouched our active air sampler, which has a valuable battery and solar panel attached. This further proves our belief that the people here are some of the most polite in the world. The objective of our deposition, air, and soil collection – placed at five locations along the Madre de Dios River – is to track the movement of mercury from gold mining through the ecosystem and to distinguish between mercury sourced in the soil versus the atmosphere. Although there is obviously an issue with the random decimation of fully forested areas in an extremely biodiverse and delicate ecosystem, our minds also went quickly to how it would affect our data. Burning organic material, like the soil, leaves, and wood, releases mercury. The objective of our deposition, air, and soil collection – placed at five locations along the Madre de Dios River – is to track the movement of mercury from gold mining through the ecosystem and to distinguish between mercury sourced in the soil versus the atmosphere. Some have speculated that the soil in this region of the world has a naturally high mercury content but, as with many aspects of this complicated ecosystem, it has not been thoroughly studied. We seek to shed light on that in our research, but because of the burning, our results will be used differently than how we had originally planned. This unexpected burning at our site will most likely change the amount of mercury measured in the air, precipitation, and soil; our results will thus show mercury released not just from the gold mining downstream, but also from the deforestation occurring at the site. One of the main things that we have learned from conducting fieldwork abroad is that you have to go with the flow and improvise when things do not go according to plan, which they often don’t. This unexpected burning at our site will most likely change the amount of mercury measured in the air, precipitation, and soil; our results will thus show mercury released not just from the gold mining downstream, but also from the deforestation occurring at the site. Now, we can analyze the air and precipitation samples from the Chilive site during and after the fires to understand how much mercury is released in burning and how it affects an ecosystem since, sadly, the practice of deforestation and setting fires is an everyday occurrence here. Whether it is by clearing areas to make a campsite, logging, burning fields to “cleanse” them before the next crop, or incinerating garbage, seeing smoke billowing from the towns and stumbling upon fully deforested areas is common. The practice of deforestation and setting fires is an everyday occurrence here. This experience at our Chilive River site of peeking behind the riparian zone – the area containing the trees lining the river – was eye-opening. We were shocked to find our previously forested collection site devoid of plants, littered with plastic, and under construction. Sadly, this experience was not unique. Boating down the river, all we see for hours on end are trees, with the exception of mining in the river and a few villages dotting the shore. Yet, despite so much dense forest alongside the river, we often found ourselves wondering why we did not see canopy trees extending into the distance beyond the riparian zone. Our previously forested collection site (as well as several afternoon hikes in which we have suddenly found ourselves in fields of massive deforestation) sheds light on why this might be – massive deforestation occurring along the river, which is seemingly invisible to those who do not venture past the shore. When we ran into a group of high school students passing through this area of the Peruvian Amazon, we asked one of the leaders his favorite part about traveling through the region. He described his awe of the “untouched natural beauty.” Admittedly slightly jaded at this point, we nodded politely and thought to ourselves how much remains unseen here, even to those who come to experience the Amazon. Keeping illegal activity hidden from the eyes of tourists and the National Guard is common practice for loggers, miners, farmers, and anyone else whose land use involves cutting down forest. What would a boatful of visitors think as they drove by endless piles of wood where there should be soaring trees? Peru would quickly lose a driver of its economy – ecotourism. Keeping illegal activity hidden from the eyes of tourists and the National Guard is common practice for loggers, miners, farmers, and anyone else whose land use involves cutting down forest. The riparian zone is like a curtain drawn along the river, hiding the massive amounts of deforestation stored just behind it. When you think of the Amazon rainforest, hear about it in biology class, or see it in nature documentaries, it brings about expectations that are almost otherworldly compared to our usual surroundings. It’s easy to imagine a forest with trees the size of buildings, plant and fungal growth on every surface, and animals everywhere. However, the reality, while often strikingly beautiful, has evoked unexpected feelings. We still have a lot to learn about the pristine natural world here, and who better to teach us than its people? 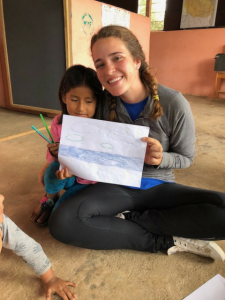 During our time in Madre de Dios, we wanted to give back to the communities that have warmly welcomed us into their homes and towns, so we brought art supplies to be shared at the local schools. 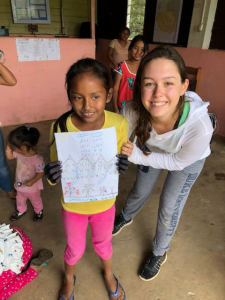 When we arrived in Boca Manu, we learned that schools had been let out on winter break for a few weeks and the teachers and students had returned to their hometowns. So, as usual, we improvised, quickly set up a meeting with the mayor, and created a plan to gather all the children living in the small town of Boca Manu. Our plan was to do a quick and fun activity teaching them about conservation and the importance of the river while providing a creative visual art outlet using supplies that are not readily available to them. We brought markers, crayons, colored pencils, and paper and led a discussion with the kids about the role the river plays in their lives and then asked them to focus their art on the river. Since school was out, the age range we were working with was from one to fifteen years old, and everyone present seemed to enjoy the activity and ability to draw freely with their new materials. Even in a group of ten-year-old boys, we could see intense concentration. The effort that they put into the activity and the effect it seemed to have on them was awesome…until they snapped out of it, realized drawing was probably uncool, and proceeded to rip up their delicately sketched work to compensate. We were very impressed with the projects we saw. Some pictures included indistinguishable squiggles, tigers, ambulances, and Legos on the river; however, most of the pictures show a beautiful river with large trees floating down it, boats moving through it, and animals gathering nearby. We were shocked by how realistic the pictures were and how perceptive the children are. 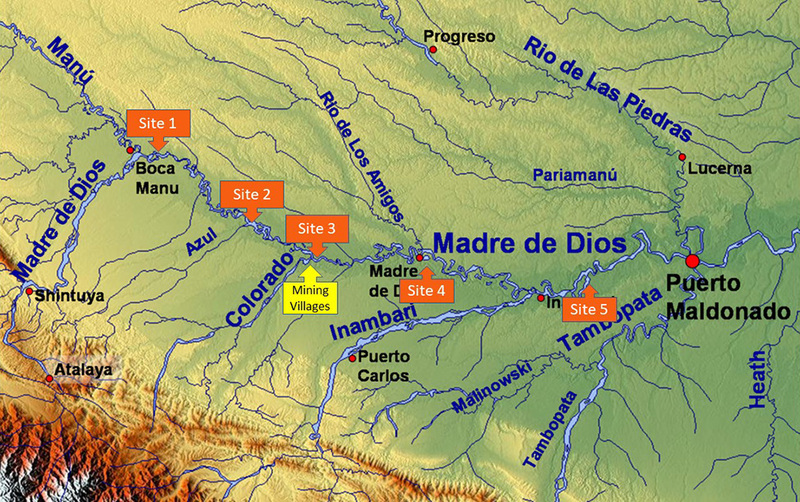 While we planned originally only to work in Boca Manu, which is upstream of mining and in a protected area (so no mining occurs around it), we started to wonder how the pictures might change as we moved downstream toward mining. As these kids drew pictures of the river they saw, would the children in Boca Colorado, a large mining town, draw a river strewn with sediment piles and mining contraptions? Would their view of the river be as ours was before coming, or show the drastic manmade developments (mining and deforestation) that have since shaped our view? We’re still upstream, waiting for our collectors to fill with rainwater, so we don’t yet know the answer to how kids in mining communities will interpret their river systems. What we do know is that the river plays an important role in the lives of these upstream communities – providing them with transportation, food, and a means of income. If deforestation and mining continue to spread, moving closer and closer to these towns, the culture and values of these communities will change. It might remain largely unseen to travelers – residing just out of view to those remaining in a boat on the river – but the effects will be felt by all within the vicinity. Read about this Bass Connections project team, Environmental Epidemiology in Latin America: Impacts of Artisanal Gold Mining in the Peruvian Amazon, led by Emily Bernhardt (Arts & Sciences) and William Pan (Nicholas School of the Environment) with Heileen Hsu-Kim (Pratt School of Engineering), Ernesto Ortiz (Duke Global Health Institute), and John Terborgh (Nicholas School). Review the team’s first and second posts about this fieldwork. Explore the Bass Connections themes of Energy & Environment and Global Health.